We make every effort to schedule patients as soon as possible. However, due to our patient load, please expect a 7-10 day wait for the next available appointment. Please inform the front desk if there are any special or urgent circumstances. 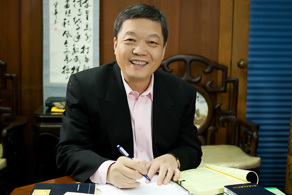 Dr. Andrew Qi Wu Ph.D, L.Ac has over 45 years of clinical and academic experience in Traditional Chinese Medicine (TCM), and is recognized as one of the top TCM doctors in his profession. These treatments have done more for me than any of the medicines I have tried. I have a better quality of life now. I tried lots of different products and treatments to get rid of it including special craddle cap shampoos, creams, olive oil and combs, but nothing worked until we saw you. After just one month and three visits your acupuncture treatments cured her cradle cap. I rarely feel any pain in my left leg anymore. My right leg is my worst leg. When I come in to get treatment, it takes the pain away totally until the next day. Under the care of Dr. Wu, I am feeling better now than I have in 5 years. I am completely off of steroids and all other forms of western medicine. Though there is a lot more healing to do, at least Dr. Wu has my mind and my body on the right track to a healthier, happier future. Sorry, our website is having problems, please let us know!.